THERE ARE SOME harsh truths you’d rather not face, like what you really look like eating a turkey drumstick, or how you sound while you sleep. Similarly, how many hours you spend on Facebook and Instagram is a potentially shame-inducing data point that for years you’ve had no real way to assess. But today, Facebook has been widely—and quietly—rolling out a tool that lets you measure how much time you spend using both the Facebook and Instagram apps. In the Facebook app on iOS and Android, you can find “Your Time on Facebook” buried in the “Settings and Privacy” menu. Click on More > Settings and Privacy, then scroll down to Your Time on Facebook. There, you’ll get a bar graph of the week, with your usage time displayed by hours and minutes per day, and the average amount of time you spent each day. On Instagram, go to Your Account > More > Settings > Your Activity, and you’ll see the equivalent. Though Facebook detailed both features in August, they’re still not fully baked at launch. The Facebook tool in particular has serious limitations, the most glaring of which is that it doesn’t factor in desktop usage at all. You can’t even access it other than in the app. The Instagram and Facebook tools also don’t tally your total usage across devices. The numbers in the bar graph indicate only how much time you spend on Facebook or Instagram on that single device. “As we continue to work on these important tools, we hope to add measure for the desktop/world wide web,” said a Facebook spokesperson in an email to WIRED. The company wouldn’t elaborate on what might prevent it from including desktop in the future. “We are starting with measuring time spent on the mobile app because people spend more time using the Facebook mobile app than on their desktop computers,” she said. Facebook declined to share the data breakdown by device or demographic, but with mobile usage in general higher among younger people, it seems likely that a disproportionate amount of older Facebook users may not be able to effectively track their usage. It also won’t help anyone who may have uninstalled the Facebook app on their phones, but still visit it on the mobile web. Still, for heavy Facebook app users, the tool should give a good sense of how much time you’ve sacrificed to the social network. The tool nudges you to take more control over your Facebook experience. Below the bar graph is the bolded suggestion to “Manage Your Time,” followed by links to your preferences menu for the News Feed and your friends list, from which you can supposedly tell the algorithm to show you more photos and less news, or vice versa, or to see more of certain friends and less of others. (Sorry, Janet.) On Instagram, you get the option to change your notifications. Which you should! You don’t need push alerts for likes on Instagram. 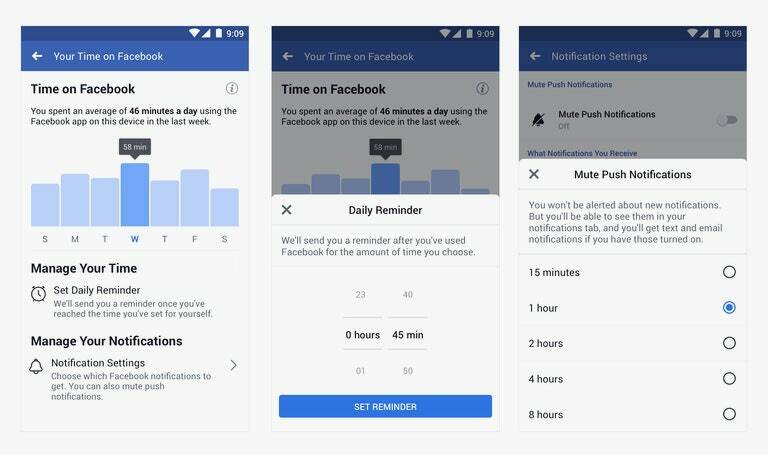 The most potentially disruptive and annoying—but helpful—new feature for both apps is a timer you can set, which Facebook politely calls a “Daily Reminder.” Tell the app how long you think it’s healthy for you to be on Facebook or Instagram, and it’ll nudge you to sign off once you reach that limit. Though Facebook detailed both features in August, they’re still not fully baked at launch. While Facebook’s digital wellness measures are welcome, it’s also industry standard at this point. This year, all the social media and the big consumer tech companies (with the notable exception of Twitter) have rolled out similar transparency tools, all with the goal of helping people reclaim their time and use their phones and apps less. As a nod to the “Time Well Spent” movement, these companies that became internationally dominant by addicting people to their infinite scrolls have admitted that maybe possibly spending hours staring at our phones doesn’t bring people joy. If you use Facebook or Instagram on iOS or a Pixel, you can compare your Facebook’s reporting numbers with those of your Screen Time and Digital Well Being reports, which track how long you spend on individual apps. Before these native tools, apps like Moment tracked your phone use for you. The jury is still out on whether knowledge is really sufficient to encourage you to action. Will knowing you spend two hours a day looking at Facebook on your phone be shameful enough to get you to stop? With the tools buried deep in your app’s settings, and giving only a partial look at your total Facebook time sink, it could easily become just another uncomfortable truth to ignore.